Apple competitor and smartphone arch nemesis Samsung on Thursday local Korea time reported quarterly profits for the second quarter dropped 8 percent from the same time last year, a dip largely blamed on abysmal performance from its mobile unit. Samsung announced a miss for the quarter ending June with profits capping out at 5.75 trillion Korean won ($4.9 billion), down 8 percent year over year. Contributing to the poor showing was a drastic drop in mobile profits, which plummeted from 4.42 trillion won in 2014 to 2.76 trillion won this past quarter, a decline of 37.6 percent. It appears Samsung's mobile division is getting squeezed between Apple on the high-end and Chinese upstarts like Xiaomi on the other. Over the same three-month period ending June, Apple managed to again grow iPhone marketshare, this time 35 percent year over year which equated to a 59 percent jump in revenues. Average selling price for iPhone was pegged at $660, up $99 from last year. According to Bloomberg, Samsung misread demand for its unique curved screen Galaxy S6 Edge model, instead focusing production efforts on normal versions that went head to head against iPhone. 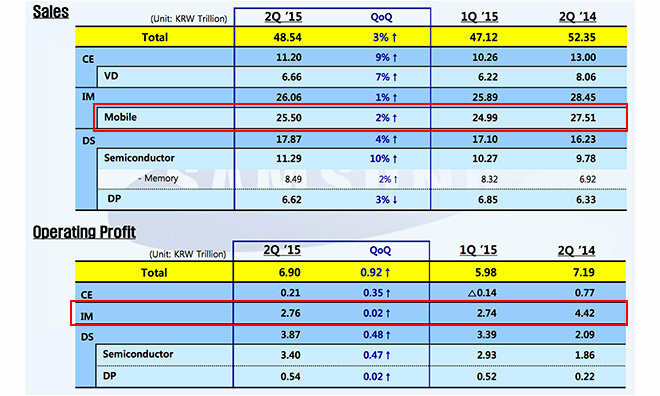 A report covering Samsung's earning estimates earlier this month cited a source as saying the company thought regular S6 sales would outpace S6 Edge four-to-one. To stanch the bleeding, Samsung plans to cut mobile sector spending, modify Galaxy product pricing and introduce more mid- and low-end models to its smartphone lineup, a strategy meant to capitalize on gaps between competing product ranges. For years the company profited on similar maneuvers targeting consumers' want for big-screened "phablet" devices, but that came to an abrupt end last year after the launch of iPhone 6 and iPhone 6 Plus.